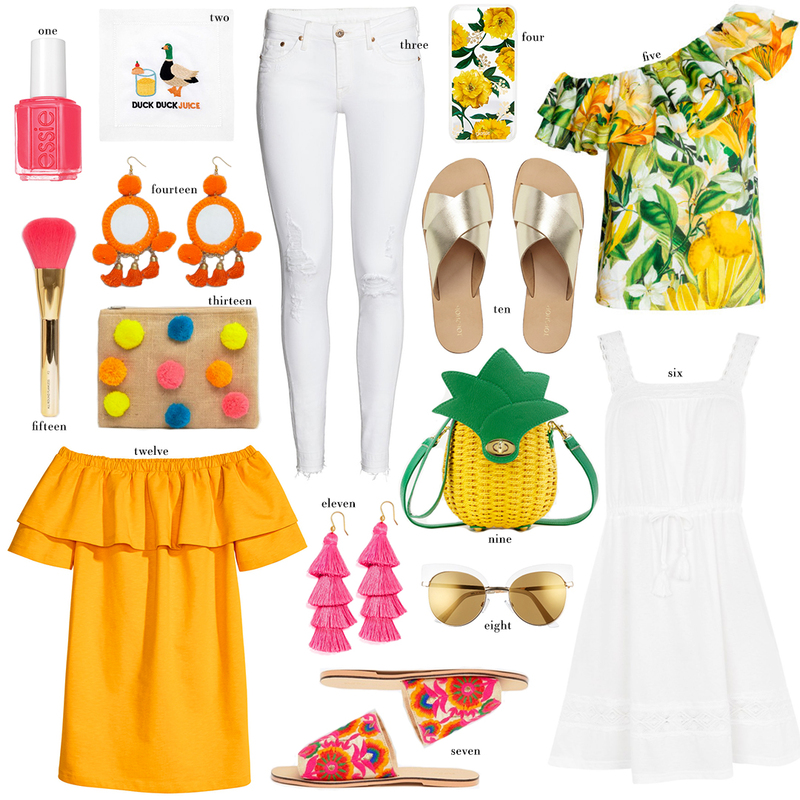 With my trip to Mexico just under a week away, I’ve got tropical prints, summer color and beachy accessories on the brain! I hadn’t planned to do a post this weekend, but when I saw all the colorful new arrivals while perusing H&M this week, I was inspired. Hope you all are having a happy Saturday! If you’re in need of a good floppy hat for summer, I can’t decide between this one and this one. They are both so chic! This black blouse with white embroidery would be perfect for the plane ride over to your destination. Comfy, casual, but super cute. My friend Ali just picked up this striped linen jumpsuit and I’m obsessed! It’s currently on sale for $32. Pom poms and embroidery jazz up this little black off-the-shoulder dress. Would be great as a coverup or for dinner! This romper is a fun coverup option on a hot day! Love the sailboat print. How darling are these pineapple print shorts?! This poncho with floral embroidery would fit right in on the beach in Playa del Carmen, don’t you think? Loving the simple gold brow bar on these mirrored sunnies! Clearly I have a thing for pom poms, because these sandals are calling my name! Wear this daisy-embroidered top with white jeans and heeled sandals for dinner. So fresh and clean! PS: don’t forget to check out THE SHOP for even more Brights, Under $100 and Under $50 finds! Love all the colorful pieces! That pineapple bag is amazing!!! and the pom pom clutch. Love! !